DublinTown have been notified by Irish Water about works to water mains that will mainly affect the SOUTHSIDE of Dublin City this weekend Friday 25th – Saturday 26th. Irish Water and Dublin City Council wish to advise customers that essential repairs will be carried out on the trunk water main on the Stillorgan Road, Donnybrook in order to safeguard the future water supply for homes and businesses in the area. 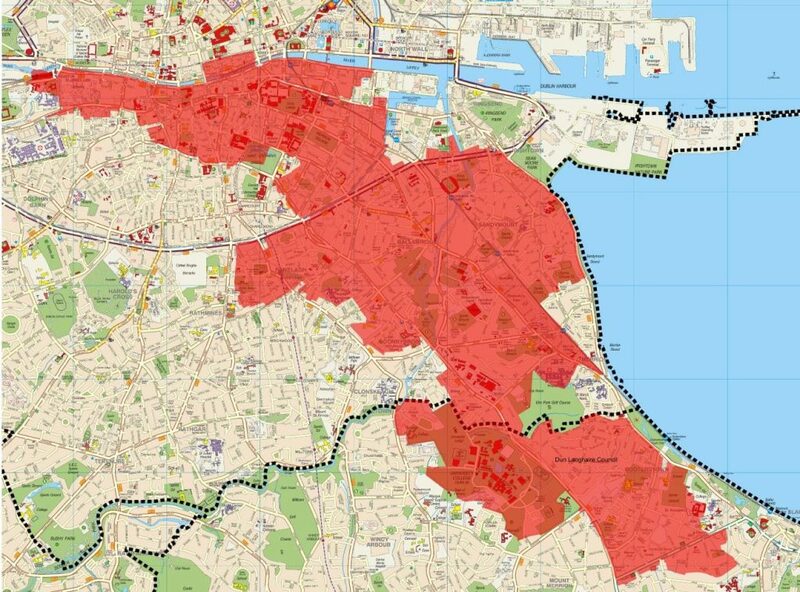 As a result there will be disruption to the water supply in parts of Dublin City and Dun Laoghaire Rathdown from midnight on Friday 25 January to Saturday evening, 26 January 2019. During these planned repair works homes and businesses in these areas may be impacted by reduced pressure and water outages. The repair is estimated to be completed on Saturday evening, 26 January. The areas that may be impacted by low pressure will include; Merrion Square; Stephens Green; Mercer Street; Redmonds Hill; Bride Street; Patrick Street; Thomas Street West; Clanwilliam Place; Grand Canal Street; Townsend Street; Trinity College and Bachelors Walk and surrounding areas, for full details see map below. In addition to low pressure, the following areas will be vulnerable to outages including; Nutley Park; Anglesea Road; Merrion Road North; Merrion Road South; Bath Avenue; Gilford Road; Pembroke Road; Mespil Road; Sussex Terrace; Belmont; Richmond Hill; Booterstown; Mt. Merrion Avenue and Seafield. Irish Water will make contact with customers who have registered on our Vulnerable Customer register in the impacted areas to offer assistance if required. Water supply to hospitals will be prioritized during the repair works. Water tankers are on stand-by and are ready to be mobilized if needed. Irish Water is encouraging customers to conserve water while these essential repairs are underway. We are urging customers to conserve water by not running taps needlessly, taking showers instead of baths and to postpone using dishwashers and washing machines where possible. Irish Water and Dublin City Council wish to apologise for any inconvenience caused by these essential repairs.